Awakening students to the wonders of nature, the power of place, the luminescence of poetry, and the hope of stewardship. 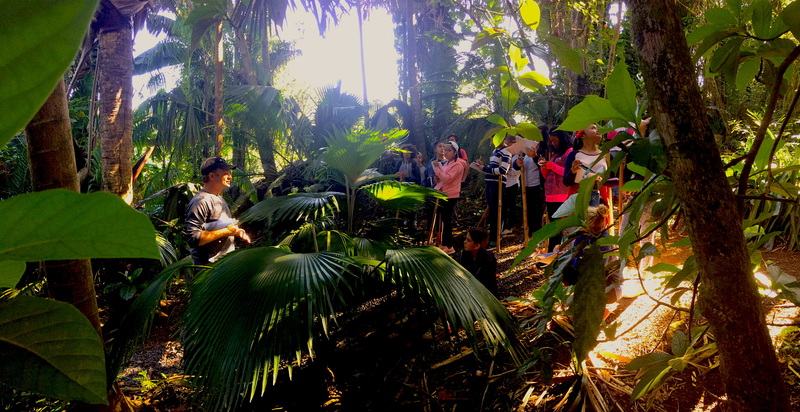 The Merwin Conservancy brings Maui’s teachers and students away from their desks and into an enchanting place filled with meaning, biodiversity, history, and inspiration. With an interdisciplinary, place-based approach to education, our goal is to awaken both students and teachers on Maui to the wonders of nature, the luminescence of poetry, and the hope of stewardship and conservation. Together, we can boost students’ engagement, academic achievement, and personal efficacy as stewards of their local environment and community. Using the palm forest and W.S. Merwin’s literary legacy as a foundation for study, students make tangible contributions to local conservation, and become immersed in local heritage, culture and landscapes, and award-winning American poetry in a historic wilderness preserve. While our current focus is on developing experiential learning with middle school teachers, we believe that students of all ages need to experience nature first-hand, understand how nature sustains life, and learn how they can live accordingly as a part of nature, rather than separate from it. Would you like to see your school get involved in the Merwin Conservancy’s program for students?